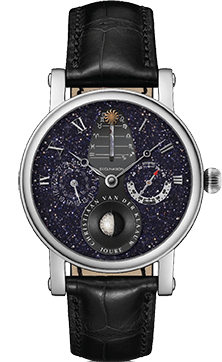 It contains a 3D moon phase, the declination of the sun and an eclipse hand, indicating the solar and lunar eclipse. 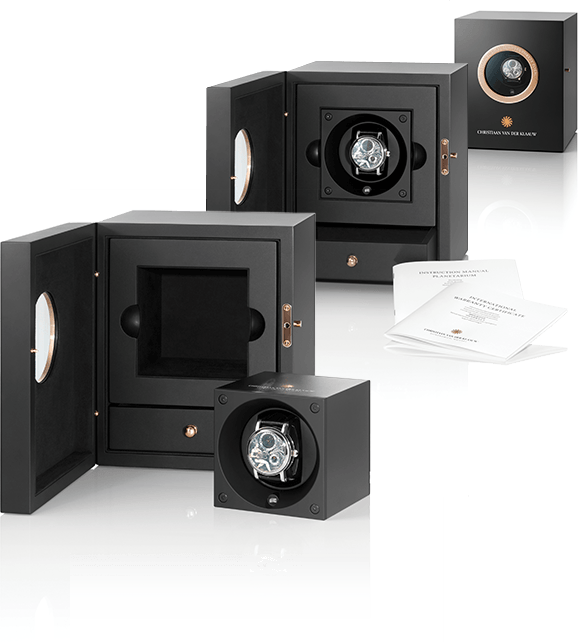 MovementCVDK7384, automatic winding, 35 jewels, twin barrel, power-reserve; 96 hour max., complication; CVDK Real Moon 1980 module. FunctionsHours, minutes, complication; date, month, 3D moon phase, declination of the sun, eclipse hand; indicates both solar and lunar eclipse. CaseWhite gold, ø 40 mm, sapphire crystal, sapphire crystal case-back. BuckleLogo engraved white gold buckle. Taking center-stage at the 6 o’clock position, the unique 3-dimensional real moon shows the moon phase in a very accurate way. But from a technical viewpoint the mechanical indication of the declination of the sun, plus the solar and lunar eclipses, is extremely interesting too. The declination of the sun is shown at the 12 o’clock position. 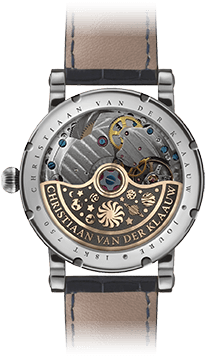 The height of the Sun in relation to the horizon can be read by means of a fine moving symbol of the sun, the Christiaan van der Klaauw brand logo. At the start of the summer, the sun symbol is at its highest position and at the start of winter, the sun symbol is at its lowest position. The 3 o’clock position is reserved for the Eclipse hand. When the Eclipse hand moves within the indication marks, there is an eclipse of the Sun or the Moon somewhere on the Earth. The Real Moon 1980 also shows the date (day and month) at the 9 o’clock position. 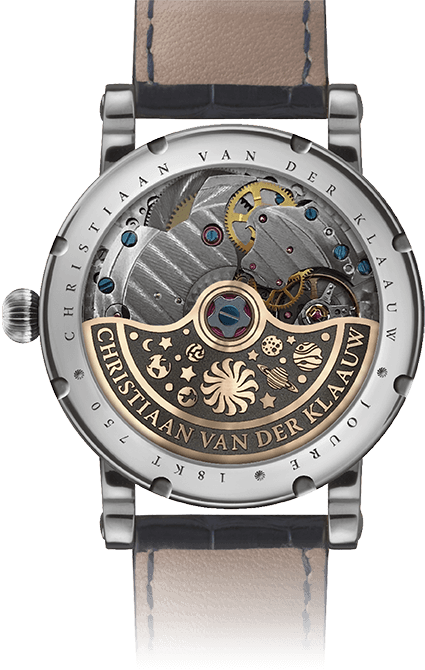 With this very complicated masterpiece - that was awarded European Watch of the Year in 2012 - Christiaan van der Klaauw Astronomical Watches proves once again its authority on astronomical watches.